Remember some two years ago when we were enjoying our first sips of Virginia Blackberry? Well, Hardywood had been secretly and quietly planning their first wild ale. Maybe you remember this photo of head brewer Brian at Barboursville Vineyards steam sanitizing two of their wine barrels. There was no indication what was going into those barrels but now I know that the first batch of Blackberry found a resting place in these red wine barrels. We are so used to instant gratification these days, it is hard to imagine waiting two years to release a beer. I know a lot of you have been waiting for Hardywood to release just such a beer. It will just be a little while longer now. 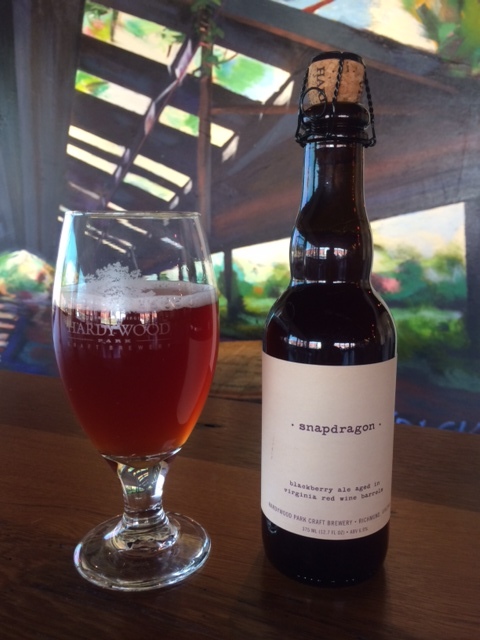 Hardywood Snapdragon will be released next Saturday September 6th starting at 2pm with 375-ml bottle sales for on and off premises consumption. Only about 1000 bottles were produced so sales will be limited to 4/guest. Spurred by the natural flora of our region, the beautifully tart character of Hardywood Snapdragon is achieved through extended interplay with wild yeasts and acid forming bacteria for over a year of conditioning in Virginia red wine barrels. Enjoy music from Exebelle & The Rusted Cavalcade as they fill the last moments of summer with country-rock inspired by Virginia’s folk tradition starting at 6pm.